Coppell High School’s all girls choir, Respira, performs “Party in the U.S.A” by Miley Cyrus on Friday during their annual performance in the Coppell High School auditorium. Respira has two shows every year where they dance and sing, and during intermission they give out dessert that comes with your ticket. As the lights dimmed and the curtains opened, Coppell High School junior and aspiring Respira captain Samantha Bui got ready to perform her first piece of the night, “Dancing Queen” by Abba alongside the other girls in Respira. Throughout the duration of the show, Bui had been spotted taking center stage, making her a strong contender for the open Respira captain spot for the 2019-2020 school year. “Being able to be Respira captain next year would be very exciting for me because I have been in Respira all of high school,” Bui said. Bui’s family is no stranger to the performing arts as both of her parents were in a band, her older sister was in show choir and her younger sister is currently a Silver Star. 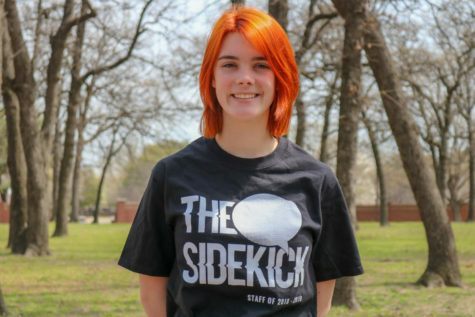 Bui started as a simple choir kid, but her transition into show choir was in part due to her move to Coppell from Wisconsin as a freshman. From the show, Bui found that she enjoyed performing “Survivor” the most as it was a powerful dance which took a lot of time to perfect and clean. The powerful moves were also featured in the hip hop routine that Bui herself choreographed in order to show the strength females carry. “The whole idea of women empowerment was important because it was just a great reminder that we as women are important and powerful, and the whole environment of all of our music being sung or written by females really helped reiterate that message that women are impactful in this world,” Bui said. Groups such as Respira provide the students of CHS with a great opportunity to express themselves without judgement. The show started off with the girls walking to their formations in bright pink dresses and introducing the audience to their central theme of women empowerment. After the curtains closed, CHS sophomore Zoe Cripe held the spotlight as she sang her emotional solo “Never Enough” from the popular film The Greatest Showman. Following the passionate solo, Respira performed its first box song of the night, “Breakaway” by Kelly Clarkson. Then, freshman Faiza Rahman went on to sing “River of Tears” by Alessia Cara. Contrary to the previous piece, Respira’s next piece “Say a Little Prayer” by Aretha Franklin was upbeat. The pastel outfits and defining dance moves took the audience members back to the late ‘60s. Afterwards, seniors Reagan Dunn and Joie Lew performed an uplifting duet cover of “Journey to the Past” from Fox’s popular film Anastasia. The first half of the show ended with a throwback to the early 2000s as Respira members sang “Born this Way” by Lady Gaga, tying the show back to Respira’s central theme of women empowerment. The audience members shortly exited the auditorium to the large commons where they found a variety of complimentary treats. The second half of the show began with the girls singing “Party in the USA” by Miley Cyrus. Shortly thereafter, freshman Katie Arrington performed “Love Song” by Sara Bareilles as she played the piano and sang. Later, “Keep Holding On” by Avril Lavigne was sung next to commemorate the seniors of Respira. Senior Kayla Madureira then took the stage and sang “The Climb” by Miley Cyrus. 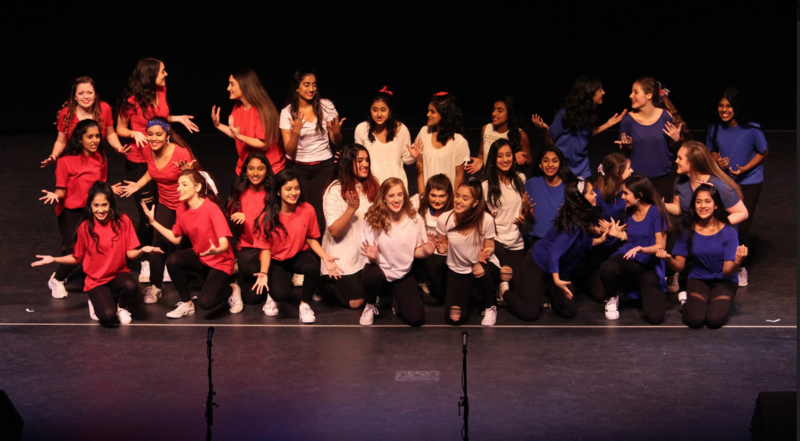 The next piece in the show was a hip hop routine recorded by Little Mix performed by senior Reagan Dunn, sophomores Eli Ochoa and Elisabeth Nail, juniors Manasa Velamuri, Christie Hernandez, Michelle Shamin, Reagan Roberts and Samantha Bui. While singing a mashup of “I Will Survive” by Gloria Gaynor and “Survivor” by Destiny’s Child, Respira closed its show on a positive note as it reiterated the strength of women. 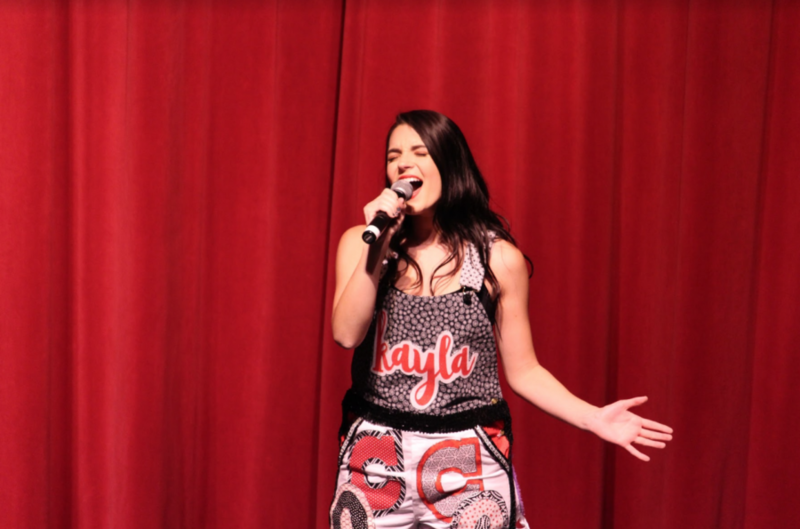 Coppell High School senior Kayla Madureira sings “The Climb” by Miley Cyrus at the annual Respira show in the Coppell High School auditorium on Friday, Nov. 9th. Respira has two shows every year where they dance and sing, and during intermission they give out dessert that comes with your ticket.